West Lynn Auto Service hires only honest, ASE-certified technicians to care for your vehicle needs. We are a registered repair shop with the Registry of Motor Vehicles, and a licensed service repair shop, offering registration checks and car inspections on all cars and motorcycles. 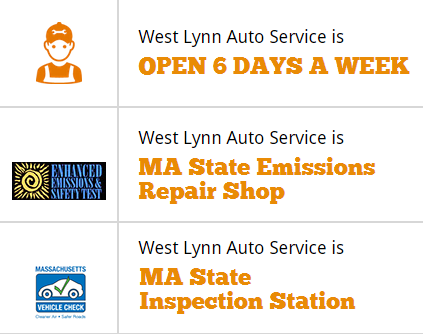 Here at West Lynn Auto Service, you can trust that we have an L1 certified technician on-site six days a week to ensure you are getting the superior service you deserve, whether you’re in need of minor or major repair work or an annual car inspection. Stop in today for a car inspection that is both honest and affordable, and for customer service that is second to none. To schedule an appointment call 781-595-9838 today or stop by for an inspection.